After a pair of games against Quebec based opponents, it’s back to divisional action for the Screaming Eagles as they tangle with the Moncton Wildcats tonight. Both teams come in having won seven of their last ten games. Moncton is currently leading the Eastern Conference while the Eagles are 6-0-1 in their last seven outings. Home ice has been a disadvantage thus far in the season series, with both teams having won in their other’s arena. 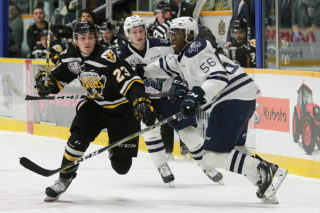 Moncton won the most recent meeting, 4-3 at Centre 200 on October 30th, after the Eagles topped the Wildcats at the Avenir Centre 5-2 on October 3rd. On that night Eagles forward Brooklyn Kalmikov became the first player to score a hat trick in the history of the new rink in Moncton. That loss seemed to wake up the Wildcats, who held a 2-3 record following the defeat to Cape Breton. Since then Moncton has gone 19-4-2 and is atop the Eastern Conference. Moncton has played 9-4-1 at home this season. The Eagles are in a tie for fifth in the conference (with Rimouski) at 16-11-2, playing 8-5-1 on the road. Tonight Rimouski visits Drummondville. Tonight’s game is a battle of teams who rank higher in the league offensively than defensively. The Screaming Eagles have scored the fifth most goals while holding the sixth best goals against. 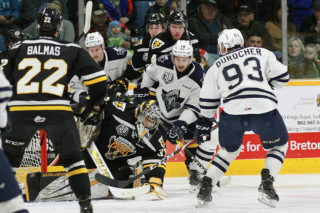 The difference for Moncton is much more pronounced: the Cats have allowed the seventh most amount of goals in the league while scoring more than anyone else. Moncton’s Jeremy McKenna ranks second in the QMJHL with 50 points, and the Wildcats have two of the league’s top five goal scorers: McKenna is third with 20, while Alexander Khovanov is fifth with 18. While Cape Breton’s Mathias Laferrière and Mitchell Balmas both rank in the top 15 in the league in points, the Eagles have received strong secondary scoring during their recent run of fine play. Gabriel Proulx has helped chip in front with seven points in his last five games (including a four game goal scoring streak) and on the blueline Adam McCormick has five points in his last four outings. Ian Smallwood, who has played both as a defenseman and a forward in recent Eagles games, was named to the QMJHL’s team of the week after producing four points and going +7 over three games. Screaming Eagles backup goaltender William Grimard was also named to the team after winning both of his starts. Both the Eagles and Wildcats will be missing key players in this evening’s game. Up front Moncton will miss big forward Anderson MacDonald, who has been limited to two two games due to injury, and forward Jacob Hudson. Two other forwards, the Wildcats top draft picks from 2017 (Jakob Pelletier) & 2018 (Elliot Desnoyers) will be absent from the lineup as they write tests for CEGEP in Quebec. There will be absences on the blueline as well. Moncton overager Gabriel Sylvestre will serve the final game of a three game ban for checking from behind. 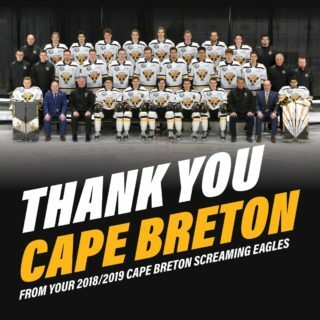 Cape Breton’s overage blueliner Wilson Forest will miss with a one suspension for removing the helmet of an opposing player, and the Eagles’ Leon Gawanke has left to participate in the Division 1A World Juniors with Germany. Screaming Eagles 2018 draft pick Ben Allison has been recalled and will make his QMJHL debut tonight. 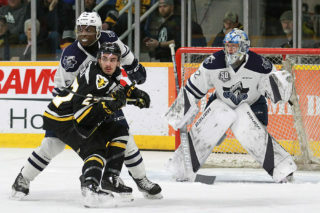 The 16 year old forward was drafted in the second round, 36th overall, in June’s draft and was the final cut from the Eagles roster in September. This year with Dartmouth in the Nova Scotia major midget league he has 21 points through 18 games. Puck drop for tonight’s game is at 7:00 PM, and you can catch all the action beginning with the pre-game show at 6:30 with Patrick McNeil on 1270 CJCB (or online at cjcbradio.com). Go Eagles Go!